Given their extremely loyal personalities, it's no surprise that Staffordshire Bull Terriers have anxiety issues. Honestly, I don’t think there is a more owner-loving breed than a staffy. While it’s nice your dog loves you this much, it can cause various issues for both you and your pup. In this article, we’ll explore the problems caused by this infliction and offer some solutions to help curb this behavior. 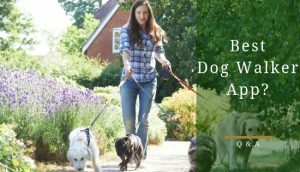 Although there’s no proven single cause of separation anxiety, there are specific factors that are common among dogs with this issue. For example, shelter dogs have this behavior much more than dogs that have grown up in the same families their whole life. It’s a common belief a loss of a family or a single person is a factor in cultivating this issue in a dog. Given the attachment issue that causes separation anxiety, this isn’t a big surprise. A change of schedule is also a recurring element in many separation anxiety cases. Let’s say you get a new job, and it requires you to stay away from home for more extended periods of time, this could cause your dog to experience anxiety. In the end, it’s about a change in the consistency of their life. As you know, dogs are relatively routine based animals. They like to know what’s going to happen and when it’s going to happen in their lives every single day. Separation anxiety is first seen when a dog becomes noticeably upset when their owner leaves. I know, this sounds normal and, usually, nothing serious will happen. However, this anxiety can result in some hazardous situations for dogs that become seriously affected. There are a few more ways you can spot an anxiety problem with your dog. 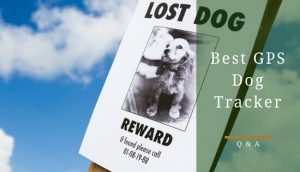 For example, it’s common to see a dog with separation anxiety with bloody paws because of an ill-fated escape attempt: an attempt to find you. And given a staffy’s personality; there’s a real possibility you might come home to a scenario like this. A staffy with separation anxiety might try to keep you from leaving. Either they’ll put themselves between you and the door or become oddly depressed right before you intend on going. In other words, they’ll do anything to avoid being alone. They’ll try anything to make you stay through playing on your guilt. 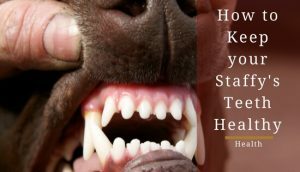 When they’re alone, they’ll start barking or display other signs of stress: excessive drooling, panting, urinating/defecating, chewing, digging, pacing, etc. Each one of these is a way of getting rid of the excess energy brought forth from their anxiety. Thankfully, there are ways to prevent this nightmare circumstance from happening every time you leave your home. 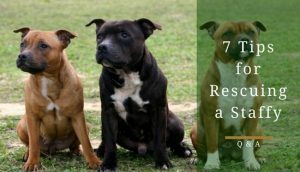 In this section, you’ll find a couple of ways to help a staffy with separation anxiety overcome it. From counter-conditioning to crate training, it will all be discussed concerning dealing with this potential problem. ​Counter-conditioning sounds somewhat complicated, but it’s actually quite simple. The primary goal of counter-conditioning is to start making your dog associate you leaving with being a good thing. For example, every time you leave your home give them a time-consuming treat such as a KONG toy stuffed with peanut butter. In doing so you do two things, distract and create an association. In other words, the KONG will take your staffy’s mind off the fact they’re alone and make them start associating this period with getting a treat. You’re tricking them into thinking that them being alone is something they want. Kong toys are immensely popular for their ruggedness, here's one on Amazon. Instead of fear and stress kicking in, these times will be filled with excitement and happiness. 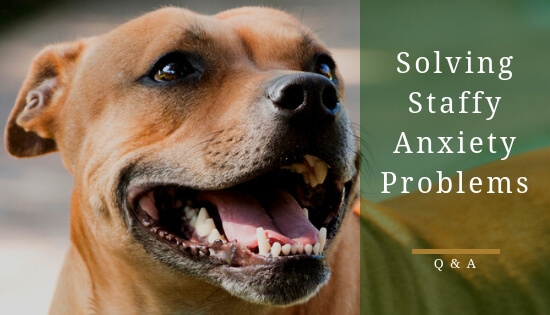 You’re using your staffy’s love of treats to bring out a feeling of security in the times you’re outside your home. You must remember to remove the treat as soon as you get home to ensure the association forms. If you don’t, your dog won’t grasp that they only get the treat when they’re alone. ​In some cases, a crate can do wonders for a dog with separation anxiety. Dogs can view a crate as a secondary home that offers a sense of security. After all, providing a secure environment is a crucial factor in treating this issue. But some dogs get even more anxious inside a crate. Their anxiety will lead them to try and escape the crate when they’re alone. And the escape attempt could lead to dangerous/tragic consequences. 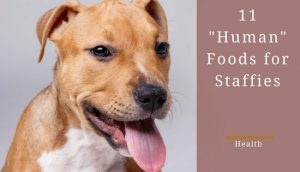 In light of this, make sure you monitor your staffy’s behavior during their crate training and observe how they act when they’re left in the crate at home. It’s essential you spend some time watching their reactions to being left in the crate when you’re home. You can try feeding them inside the crate or leaving it opening during the day to see how they act towards it. If your staffy starts howling or barking, a crate probably isn’t the best option for you. If this happens, try containing your staffy to one room with a gate or a gate-like structure. But never leave them inside a room behind a shut door. The feeling of being contained will add to your staffy's stress level and their anxiety will become much worse. For more information, we have a full article dedicated to crate training. ​As a dog owner, one mantra you should always remember is a tired pup is a good pup. Try taking your staffy on a long walk right before you plan on leaving as it could rid of all their excess energy that gets turned into stress and anxiety. If you don’t have the time for a long walk, you could try an extensive playing session right before you leave. Any substantial form of exercise could help relieve this debilitating behavior. Maybe try a game of fetch in the backyard for a good 5 to 10 minutes before you leave. 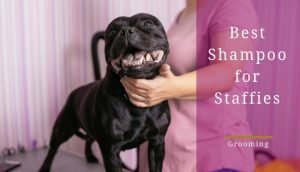 If you're struggling for exercise ideas, take a look at our article on exercise ideas for staffies. After all, a tired pup might be too exhausted to exert the necessary energy for an escape attempt. They may even sleep the whole time you’re gone. It’s all about keeping their mind active and focused on anything other than you not being there. 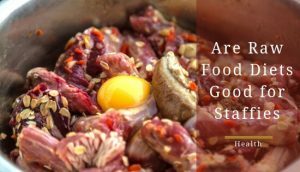 Raw Food Diet for Staffies – Are Raw Diets Good for Dogs? 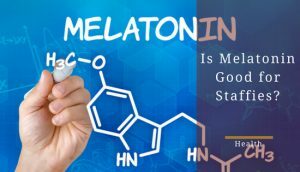 Melatonin for Staffies – Is Melatonin Good for Dogs?